La Mom is now accepting applications for the position of NANNY! Please send your resumé to lamom.paris@gmail.com if interested. My fab day gets cut short as I start feeling sick at Starbucks. Could it have been the grande crême brulée latte and the deux pain au chocolats I wolfed down? Quite possibly. My nanny was dressed in my clothes! Specifically, my favorite Zadig & Voltaire Elvis sweater, Seven skinny jeans, and Repetto ballerinas. Oh la la! was an understatement! As she profusely apologized and scurried to the bathroom to take off my clothes, I ran back to my bathroom to make sure she hadn't swiped my jewelry. I realized my shower towel was soaking wet and my bathtub was full of fresh suds. Are you as grossed out as I was? Eh oui, my nanny took a shower and used my towel to dry off with! I don't mind her showering while the French Fries are sleeping, but I certainly draw the line at her using my towel. What is nastier? Stepping in Paris dog poop on an almost daily basis or having your nanny use your bath towel? Help me decide because I'm stuck on this one! Something obviously got lost in translation. What I said when I left was "help yourself in the kitchen", NOT "help yourself in my closet". Only in France can you find a dog hanging out in a grocery store, clothing boutique, café or restaurant. The French worship at the altar of dogs. La Mom took this picture at her local Monoprix store. I was très surprised to see the dog attatched to the pole and not wandering around with his owner! Big Cheese used to dine with clients at a posh little resto called Le Matisse where he saw on several occasionsYves Saint Laurent at a table with a very special guest - his dog! A dish of food was even laid out for the chien too. That's sooo French, n'est-ce pas? I took this picture at the Galeries Lafayette Home store. Leave it to the French to dedicate a holiday display widow to dogs. Chic! Back in November, La Mom was snubbed by someone she thought was her friend. I bumped into Madame J at our local Monoprix store (Monoprix is France's equivalent to Target - although sadly, it's not even a close comparison). La Mom: Hey! Madame J, it's been ages since I've seen you! How were your October holidays? Are you going back to the US for Thanksgiving? She looked at me like I was as stinky as French cheese and turned around and walked off! ...when Madame J shows up at the party and proceeds to Love Bomb moi! She couldn't stop touching my shoulder, patting my arm, hanging on every word I had to say all night! Suddenly, I had become the next best thing since sliced bread. For months, she had been giving me a bit of the cold shoulder, but the stinky cheese encounter at Monoprix left me speechless. 1/ My husband's cheese is bigger than her husband's cheese. 2/ A year ago I moved into an FOB (f*** off building) around the corner from her. The building is stately and gorgeous. Plus, we're on the top floor with a fab view of the Eiffel Tower. Jealous un petit peu? 3/ Her group of friends wants to include me in things they do. Does she think I'm stealing them? (I'm not). Is she jealous un petit peu? Maybe. But last time I checked, we weren't in high school anymore. Well actually, maybe we are. 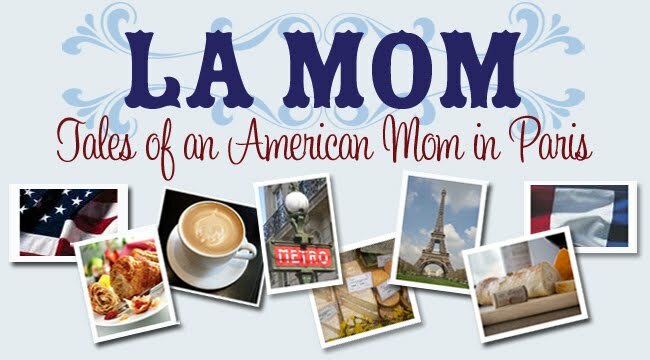 The expat Paris mommy track is a bit cliquish. As I was nursing my Love Bomb injuries the next morning (sore shoulder, bruised arm), it occured to me that Madame J should have Love Bombed my kids instead. Then at least I would have had another reason to go back to the American Hospital in Paris to have the French Fries checked by my favorite pediatrician - Dr. Hot!